UPDATE: Amati Lenta will have its World Premiere on Friday, March 8. Olivia Block and Biliana Voutchkova will perform guided improvisational pieces for solo violin and manipulated cassette tape. Tapes will feature solo violin and field recordings prepared by the artists in advance. Biliana will, in a sense, accompany herself from a previous time period, captured on cassette tape. Her performance will be guided by the speed and clarity of the tape as it is altered and manipulated (performed) live by Olivia. Performances will be re-recorded live, then multiplied further by the next performance. The work is constantly developing and building a kind of an archive of itself which is evident each time it is played live. These pieces emphasize themes related to the multiple ways time is experienced through sound and recordings, and how meaning is created and altered through the recording process of sound. 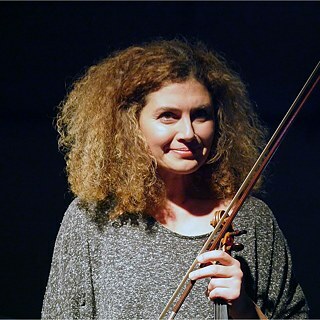 Biliana Voutchkova is a thoroughly engaged composer-performer/interpreter whose work combines regular performances of major solo violin/ensemble works, new works by contemporary composers often written for her, and her own work with real time composition and improvisation, long length formats and performance. Biliana's research as a creative artist spans the widest possible range of sound/music/movement and extends the sonic and technical capacities of her instrument evolving into the development of a highly individual musical language. She lives in Berlin, appears at festivals and concert series worldwide as a soloist and in collaboration with numerous ensembles.The release of her solo album Modus of Raw and the recent triplet Blurred Music were received with critical acclaim. Olivia Block is a media artist and composer. She creates scores for orchestra and chamber groups, studio-based sound art compositions for releases and concerts, site-specific multi-speaker installations and sound design for cinema. Her compositions include field recordings, amplified objects, chamber and orchestral instruments, and electronic textures. She performs her pieces for inside piano, pipe organ, amplified objects, shortwave radio, and many other sound-making materials. Block tours internationally and resides in Chicago. Her latest LP release, Dissolution, is currently published on Glistening Examples.